For decades, Saudi Arabia and Pakistan have maintained a unique alliance, rooted in Al Saud’s self-anointed religious legitimacy, the strength and expertise of Pakistan’s military, the two states’ common geopolitical interests and the 1.5 million Pakistani laborers in the kingdom. The Saudis see Pakistan, which shares a 565-mile border with Iran and is the only Muslim nation with nuclear weapons, as a vital ally capable of serving as an effective counterweight to growing Iranian influence. The kingdom came to the side of Pakistan in the late 1990s and provided the country with $2 billion worth of free crude oil after the U.S. imposed nuclear sanctions on Islamabad. In fact, Riyadh tacitly bankrolled Pakistan’s nuclear weapons program. It is widely presumed that if Saudi Arabia were to decide to pursue a nuclear weapons program, Pakistan would help Riyadh achieve that status. Since the 1960s, Pakistani soldiers have been permanently stationed in the kingdom and Islamabad has provided Saudi Arabia with much military aid, expertise and cooperation on regional affairs. In 1969, Pakistani pilots helped the Saudis attack South Yemen to counter rebel forces. During the 1980s, Pakistan deployed its troops to Saudi Arabia to protect the kingdom from the mutually perceived Iranian threat, while Riyadh collaborated with Islamabad and Washington to train and arm the mujahideen fighting in the Soviet-Afghan War (1979-1989). During the Gulf War of 1991, 11,000 Pakistani troops were in Saudi Arabia “protecting” holy sites. When Bahrain’s uprising erupted in 2011, the Fauji Foundation (a Pakistani energy conglomerate linked to the military) recruited at least 2,500 former Pakistani servicemen to assist Gulf Arab security forces in suppressing Shi’ite demonstrators demanding equality in the Sunni-ruled island kingdom. Despite this strong historical alliance, Pakistan decided against entering the fray in Yemen earlier this year for three main reasons. First, a high priority for Pakistan is to balance its relations with Saudi Arabia and neighboring Iran. Islamabad saw siding with Riyadh in Yemen—a flashpoint in the Saudi-Iranian geopolitical rivalry—as risky, given its potential to offset this delicate balance and poison the atmosphere for any possible improvement in relations with Iran. Second, many Pakistani Shiites staunchly opposed the Saudi campaign against Yemen’s Zaydi Houthi rebel movement. Officials in Islamabad viewed Pakistan’s entry into the conflict in Yemen as having the potential to ignite sectarian unrest and terrorism at home. Third, Pakistan’s military was focused on Operation Zarb-i-Azb along the Afghan border and did not want to open a third front for Pakistan’s already stretched military. As the military campaign against the Houthis has thus far failed to achieve Saudi Arabia’s stated objectives and appears to be a quagmire, Pakistani officials were wise to have resisted joining the Gulf Arab–dominated coalition in Yemen. Some analysts have even suggested that the Saudis may soon become grateful for Pakistan’s decision to maintain a neutral stance, because it is possible that Islamabad could play a future role as peace broker in Yemen. Yet given the realities on the ground in Yemen, particularly pertaining to the growing power of militant Islamist extremists whose factions are unlikely to agree to any form of a negotiated peace agreement, any political compromise that can settle the Yemeni crisis appears merely a concept at this juncture. As Islamabad and Riyadh explore deeper relations with other players in the region, the long-term trajectory of Saudi Arabia’s alliance with Pakistan is difficult to predict. Like the U.S., Pakistan recently has signaled its interest in making a pivot to Asia and away from the Middle East. China, which has wielded significant political and economic influence in Pakistan for many years, is financing and constructing an economic corridor linking Pakistan’s port of Gwadar to China’s Xinjiang province. The same month in which Pakistan refused to deploy troops to join the Saudi-led coalition in Yemen, Islamabad promised Beijing 10,000 troops (5,000 of which came from the elite “Special Services Group”) to protect Chinese laborers working on the construction of this corridor in Pakistan. It says a lot about Sino-Pakistani relations that the Chinese would agree to build the economic corridor under such security conditions. Unquestionably, Islamabad serves as one of Beijing’s key strategic allies in its battle against India for economic and political supremacy in greater Asia. Included in the $46 billion deal was the construction of a gas pipeline (to be completed as soon as 2017) linking the port of Gwadar to Iran’s South Pars field. The pipeline is expected to cost $3 billion, of which $2 billion will finance the construction of a Liquefied Natural Gas terminal at the port of Gwadar. China, determined to create a modern-day Silk Road linking its eastern cities to the Persian Gulf, agreed to provide 85 percent of the funding for this pipeline with a loan; Pakistan has agreed to finance the rest. Clearly, energy-starved Pakistan is eager to explore deeper relations with energy-rich Iran, now that global powers and Tehran have signed the nuclear agreement and international sanctions are beginning to loosen. Yet in viewing Iran as a predatory state determined to wreak havoc across the Middle East, the Saudi rulers are most unsettled by Islamabad’s deepening relationship with Tehran and question Pakistan’s long-term reliability as a strategic ally. The Saudis have actively sought to counter Iranian influence in Pakistan. For example, earlier this year, WikiLeaks released documents exposing high-ranking Saudi diplomats’ efforts to promote Saudi influence in Pakistan’s universities and prevent Iranian scholars from making inroads at such academic institutions in Pakistan. Further complicating the landscape is Saudi Arabia’s deepening relationship with India. Although official diplomatic relations between the two states date back to 1955, Riyadh and Delhi’s relationship received a major upgrade in 2006 when King Abdullah visited India and signed the Delhi Declaration, aimed at enhancing bilateral cooperation in security sectors. In 2010, India’s Prime Minister Manmohan Singh and King Abdullah signed the Riyadh Declaration, establishing the basis for enhanced counterterrorism efforts between the two governments and the eventual signing of the extradition treaty. In 2012, following the visit of India’s Defense Minister to the kingdom, Delhi reportedly helped Riyadh establish a jungle warfare college, aimed at training Saudi forces to combat al-Qaeda fighters near Saudi Arabia’s southern border with Yemen. The extent to which Indian-Saudi cooperation on security improved was illustrated in July 2012, when Saudi authorities arrested Zabiuddin Ansari, the Indian terrorist responsible for the 2008 Mumbai attacks. He was living in the kingdom with a Pakistani passport while seeking new recruits for a “massive attack” in India. Although Ansari’s possession of a Pakistani passport would have normally led the Saudis to extradite him to Pakistan, officials in Riyadh extradited Ansari to India, which constituted a watershed moment in Indian-Saudi cooperation. Although unlikely that India could ever replace Pakistan’s role in Saudi Arabia’s foreign policy strategy, growing Indian-Saudi economic ties could impact Riyadh’s perception of Pakistan’s strategic value as a long-term partner. In certain ways, trade with India appears much more promising to Saudi Arabia than with Pakistan. Even though Pakistan is largely dependent on the kingdom economically, bilateral trade is uneven. It mostly consists of Saudi exports to Pakistan, which is running a growing trade deficit with Saudi Arabia. Indian-Saudi trade is much larger, as well as much more balanced and diverse than the kingdom’s trade with Pakistan. To maintain perspective, Indian-Saudi trade surpasses Pakistan’s trade with Saudi Arabia and the five other Gulf Cooperation Council (GCC) members combined. However, the future of Indian-Iranian trade, now that international powers and Iran have signed the nuclear agreement, will undoubtedly influence the extent to which India turns to Saudi Arabia as an economic partner in the years ahead. Saudi Arabia and Pakistan are bonded by a special relationship. The Saudis have used their wealth to invest in advanced weaponry, yet for decades Pakistan’s manpower and military expertise has played a pivotal role in the kingdom’s security landscape. As underscored by General Sharif’s meeting with the Saudi king in Riyadh earlier this month, which took place upon the conclusion of joint military drills, Riyadh and Islamabad continue to go to great lengths to remain engaged in each other’s security. The alliance’s “reset” demonstrated that the Yemeni crisis is not the only issue which defines Saudi-Pakistani relations, and different strategies for reacting to the conflict did not end the “special relationship.” Nonetheless, Pakistan’s reasons for refusing to join Operation Decisive Storm are indicative of new geopolitical realities and new priorities for Pakistan’s leadership which have perhaps compromised the two nations’ previously held high level of trust. Moving forward, it is likely that the Gulf Arab monarchies—not only Saudi Arabia, but also the UAE—will raise further questions about Islamabad’s commitment to GCC security in light of the Yemen disagreement. 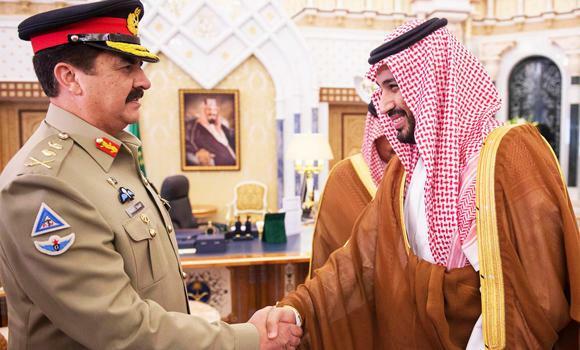 In fact, as ties between Pakistan and the UAE suffered from the fallout over Yemen last April, many analysts maintained that General Sharif’s recent visit to Riyadh was in part aimed at reaching out to the Emirati leaders via Saudi Arabia, the GCC’s powerhouse. As Middle Eastern conflicts raise tension between Saudi Arabia and Iran, Pakistan will find it increasingly challenging to navigate through the turmoil while maintaining a meaningful balance in its relationships with Riyadh and Tehran. At the same time, Pakistan’s own sectarian dynamics and wide resentment of Saudi Arabia on the part of large segments of Pakistan’s population (who attribute their country’s crises with Islamist extremism to the kingdom’s influence over the span of several decades) lead many in Pakistan to see wisdom in a pivot from Saudi Arabia to the Far East. Of course, looming in the background is Riyadh’s warming relationship with Delhi, a negative geopolitical development from Islamabad’s perspective that could influence the future of Saudi-Pakistani relations. Pakistan is therefore likely to continue exploring opportunities to deepen relations with non-Arab countries such as China and Iran while Indian-Saudi ties also grow. By the same token, Riyadh will want to avoid alienating Islamabad, as the Saudis face a host of growing domestic and regional security challenges in which Pakistan’s manpower and diplomatic influence could well suit Saudi interests. Saudi Arabia and Pakistan will remain close allies, but despite the “reset” earlier this month, the evolving Saudi-Pakistani alliance will likely face unforeseen complications in the future. Giorgio Cafiero (N-4912-2015) is the Co-Founder of Gulf State Analytics. Daniel Wagner (N-8257-2015) is the CEO of Country Risk Solutions. It has been re-pusblished at IndraStra's website with due permission from the authors.